There was flame, smoke and an explosion. He emerged from it, even though more than a little singed, with his spirit intact. The battle scars served as reminders that he wasn't going to give up on his goals. And so he sat out the season, recovered sufficiently, and then threw himself into training. He was organised about it all. He did events that would prepare him sufficiently for the task. He ran in the woods to keep himself fit. He rode on the trails near his house from dawn to dusk. He flew through the air, astride that motorcycle of his. In his own words, he was chasing rainbows. It was around this time last year that I began hounding CS Santosh. I wanted to know what it was that he was training for. Well, truth be told, I knew, we all knew, what he was training for. We just wanted him to admit it. To utter those two glorious syllables. Back then, he'd been rather tight-lipped about it. He'd given me vague answers, saying things like, "It is what you think it is, but I can't say anything till it is all confirmed." Or "I don't want to jinx it." Well, he didn't jinx it. 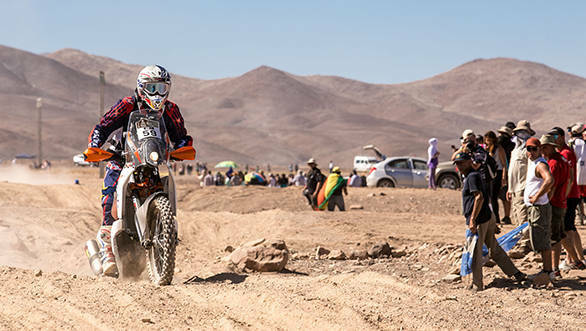 When the Dakar Rally kicked off on January 4, 2015, there was that No 59 KTM 450 Rallye that also took the start. In a haze of vanishing sponsors and broken gentlemen's agreements, Santosh had somehow made it to South America. He'd done it on his own steam, with more than just a little help from his parents. He survived getting lost in the desert, a crash that resulted in a bloody nose, a broken foot and an injured shoulder. And he finished 36th, emerging, once again, wounded and victorious all at once. A hero's welcome awaited him at the Kempegowda International Airport in Bangalore. It was a far cry from heading home alone in a cab, which was what he'd usually do when he got back from motorsport events. He looked at the crowd gathered there for him, scratched his eyebrow with his thumb, looked down and shook his head in disbelief. And then, amidst the loud cheering, he was hoisted on the shoulders of his friends, fellow competitors, and well wishers. The awards followed, as did articles in newspapers and magazines alike. And the odd, no pun intended, sign of recognition  like the time that he got to ring the bell in the Bombay Stock Exchange. But even amidst all of this, he seemed to keep his head down and continued to take his daily humble pill. All his photos were hashtagged #worldfamousinBangalore. And so another year went by. A year of training, but no competitive events. Of being hailed as the first Indian to start and finish the legendary Dakar Rally, but without sponsors knocking at his door. Of being invited to award ceremonies and parties, but without people lining up to back him. It seemed like he'd arrived. And maybe he had. Just not at his ideal destination. This time around, given that it was soon to be October, I once again began my customary hounding. The answers weren't as vague as last time. But they weren't as positive, either. "It's a tough question for me to answer right now. I'm on the fence. I'm hopeful I'll be able to make the start of the Dakar 2016," he said. And then those dreaded words I'd sort of been expecting were finally uttered. "I'm waiting for my sponsorship." Turns out that other than some money from Red Bull and Ceat, which isn't enough to get him to Dakar, nothing else had materialised. The whole situation reminded me of another racer I'd spoken to in a land far far away. "When I won my championship, they celebrated me like I was the next big thing, like I'd make it to Formula 1 soon. But when it came down to real support, they all disappeared," he'd laughed. Not with bitterness, but amused by the irony of it all. "You try to give it everything, but then you realise..." he continued, his voice trailing off, a faraway look in his eyes. It seemed like he'd got off the racetrack and into the service road. He'd shifted to Plan B. And it was about Plan B that I asked Santosh next. In the event that he doesn't take the start of the 2016 Dakar Rally, what then? "Plan B," he said, "is spectating." Coming from him, that is a very scary thought. Over the years, I've seen racers spend time away from training, making presentations that would do multinational companies proud, and going to sponsorship meeting after sponsorship meeting. More often than not, nothing comes of it, but they still try. It is that endless quest to see them actually take the start of the next event they want to compete in. The many emails and phone calls we get asking whether we'll cover this, that or the other. It isn't megalomania. It's a means to an end. It's coverage that they hope will end in sponsorship of some sort. And sponsorship, that in turn will ensure that they keep their dreams alive. And these dreams really must be kept alive. They ensure we don't let the mundane take over. They see to it that we make the most of the time we have here. They drive us forward and make us perform. Even when keeping the faith isn't easy, we've still got to do it, because without these dreams we'd get nowhere. Chasing rainbows then, no matter how tough, seems the best thing to do. But a little help along the way... that might make things better still.